"We designed Carlton Landing to promote a healthy, balanced lifestyle that connects with nature," says Grant Humphreys, the town's founder. “The Residence Club makes vacation-home ownership more luxurious, convenient and accessible to families..."
Oklahoma’s newest town and resort community, situated along Lake Eufaula, enters its next phase of development with the introduction of The Residence Club at Carlton Landing. The Residence Club —a collection of upscale second homes scheduled to break ground October 17—already has 22 buyers. Much of the early success stems from the Club’s shared-ownership program. While the Club residences feature the closest location to the lakefront, they are offered at the lowest price point of any property at Carlton Landing. Club ownership also delivers a remarkable array of amenities and privileges, including boat club membership. Club owners can select from four floor plans: Park Street (1,080 sq. ft., 3 bedrooms), Lakeview (1,434 sq. ft., 4 bedrooms), Veranda (1,800 sq. ft., 4 bedrooms) and Terrace (2,191 and 2,208 sq. ft., three bedrooms). 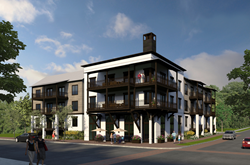 All but the Terrace homes will be in the Club building, the structure slated for the October groundbreaking. The sumptuous Terrace residences will occupy the top floor of the Lake House, a planned facility with resort-style pool, kid’s pool, hot tub, members’ lounge, restaurant, and fitness room. All Club residences will be just steps from the Carlton Landing boat docks and beaches. Ownership starts at $76,000, with larger residences commanding higher pricing. Club owners also enjoy exchange privileges through the Elite Alliance (elitealliance.com), which allows them to vacation at 70 coveted locations worldwide. Carlton Landing is Oklahoma’s newest town. Grant and Jen Humphreys, the lakeside community’s first residents, founded the community in 2011. The town occupies one of Lake Eufaula’s most picturesque areas, with sandy beaches, towering cliffs, beautiful woodlands and some of the lake’s finest water quality. Renowned planner and architect Andreas Duany, known for designing the Rosemary Beach and Seaside communities on the Florida panhandle, crafted the Carlton Landing master plan with Humphreys in 2008. Inspired by the New Urbanism movement—which holds that life, work and play are all central to a community’s vitality—Carlton Landing is the first development of its kind to become a distinct municipality. The master plan includes schools, a waterfront chapel, Nature Center, community parks, trails, and a town center with restaurants and shops. Plans call for more than 3,000 homes and a generational development timeline. For more information, visit http://www.carltonlanding.com.